Controlling your home’s features with merely a tap or a voice is no longer a reserved for The Jetsons. 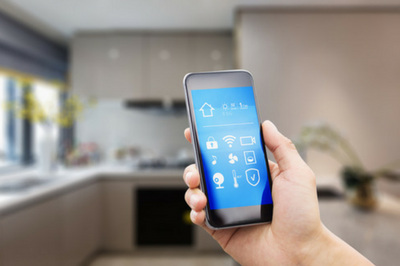 By installing just a few of today’s smart home devices, your phone can control your home’s temperature, lighting, and appliances. Smart homes are houses that have “connected” appliances that can be controlled from one device: either your smartphone or a personal assistant like Amazon Echo or Google Home. With all these appliances on the same wireless connection, they can communicate with one another and help your home run more efficiently. Smart homes are generally more efficient, safer, and – well – cooler than regular homes. 1. Keep your wireless password and cell phone on hand when connecting your smart home. Here’s another tip: during or after set up, you may be directed to install an app on your phone. Before you start, make sure your phone has storage space available. 2. Set up the device you will use to control your smart home. 3. After your first smart device is working, install and set up your other devices and connect them to your wireless network. 4. Don’t forget! Many smart home appliances and devices also let you connect to a personal assistant like Amazon Echo or Google Home. With these personal assistants, you can use voice commands to manage your smart home network. For example, you can install smart skills for your Echo like adjusting your thermostat or you can ask Google Home to turn on your favorite TV show with Chromecast.